What is on our Meatless Monday menu today? 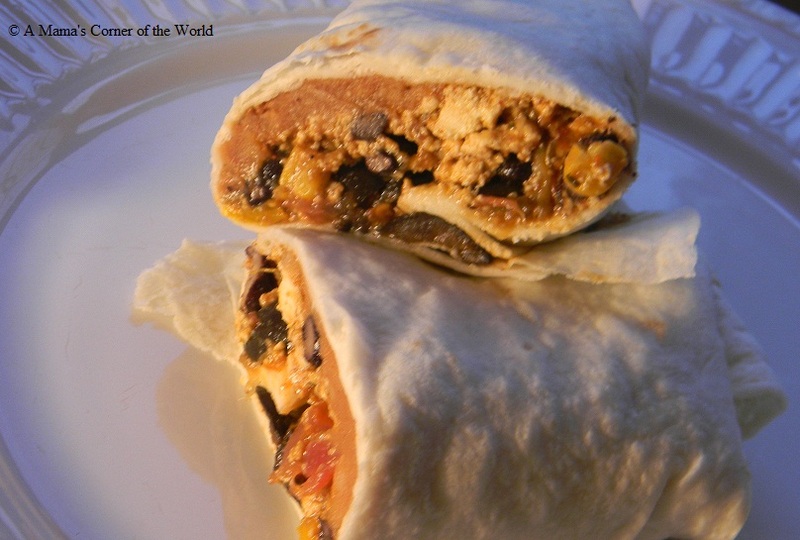 This spicy black bean and tofu burrito recipe is our latest meatless meal crowd pleaser. The girls had no idea that tofu replaced the usual ground turkey—and loved the filling both in tortilla wraps and over taco salads. If you love Mexican flavors—and have been hesitant to cook with tofu—this makes a great meatless meal introduction for the skeptical. Your favorite burrito toppings: Refried Beans, Sliced Black Olives, Green Onions, Shredded Lettuce, Chopped Tomatoes, Jalapeno Slices, Shredded Cheese, Sour Cream, Guacamole, etc. The photo simply has some vegetarian refried beans, black olives and shredded cheese topping the filling (my middle daughter's ideal burrito)! Prepare the black bean and tofu burrito filling. Heat the butter and oil in a large skillet. Add the onion, peppers, and crumbled tofu. Stir well to coat the tofu in the butter and oil. Saute for about 3-5 minutes until onions and peppers are slightly tender. Add the spices, stirring to coat the vegetables. Add the salsa, beans, chilis and corn. Bring mixture to a boil and reduce heat. Cover and simmer for 20 minutes—stirring occasionally. Add in the shredded cheese and cook an additional 5 minutes. I like to set it aside (even in the refrigerator if neceassary) for at least 30-60 minutes to allow the tofu to absorb the flavors of the mixture—then reheat it for a few minutes prior to adding it to the warmed burrito shells. Build the black bean and tofu burritos. I add just2-3 tbsp. of the burrito filling down the center of a slightly warmed tortilla wrap. Top with desired toppings and fold up burrito style. My girls require sliced black olives and shredded monterey jack cheese--and I add a little of everything to the burritos for my husband and myself! Serve. I serve with black bean and tof burritos with vegetarian refried beans and a veggie packed Spanish rice.